A £300m biomass facility has been targeted to be built in a dock at Liverpool port. British renewable energy firm RES has revealed plans for the project at the Port of Liverpool’s Alexandra Dock. 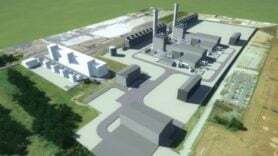 RES would use wood as a fuel source for the plant, as well as potentially waste wood from the surrounding area, and believes the facility could generate between 100-150MW, enough electricity for the equivalent of 170,000 to 250,000 homes every year. And RES also plans to exploit the location of the plant. With the bustling Port of Liverpool, owned by Peel Ports, on its doorstep, RES intends to transport 80% of biomass fuel to the site by ship. RES hopes to have planning permission by autumn next year and plans to have the site operational by 2015. Liverpool port handles over 33m tonnes of cargo each year. It is already the UK entry point for many forest products, biomass fuels and wind turbine components that serve the renewable energy industry. With the government confirming this week that funding worth £60m would be given to ports in the north east to ensure they had the capability to handle offshore parts destined for windfarms along and in the North Sea, news of the biomass project is a boost for the north west. It also highlights the growing link between the renewable energy and shipping industries. The shipping industry’s fortunes took a downturn about a year before the credit crunch bit elsewhere. Work at many yards ground to a standstill as owners were unable to pay for vessels on order. But the renewable energy sector is reliant on shipping. Turbines need transporting on specialist vessels and these need building by specialist yards. The biomass project is a further boost for Liverpool as a centre of renewable excellence. Only last month European energy giant Enfinity picked the city as the base for its first UK headquarters.